<br>Blur is the ultimate racing experience, dropping you into heart-pumping, electrified in-the-pack action with 20 cars targeting the finish line and battling each other as they trade paint. Intense power-ups, including the ability to blast other cars out of the way with huge bursts of energy, as well as defensive shields, nitro speed boosts, and landmines create realistic damage and destruction. Featuring 4-player split-screen action that offers you a new kind of racing experience, one that allows you to race with your friends and as part of a network of players in high intensity competition and fun. The new racing game from the award-winning team at Bizarre Creations delivers the most intense and fun racing experience ever. 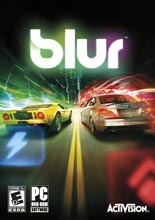 Beyond the action-packed tracks filled with fast curves, sneaky alternate routes, and hair-raising jumps, Blur's story unfolds through a unique and innovative community-based interface, reaching far beyond the game itself. Build a community of allies, rivals and fans where you can share personalized racing experiences with friends both inside and outside the game.